Frozen Fish is one of The Job Center microgames in WarioWare D.I.Y. The player has to draw the art of the fish that Wario catches. 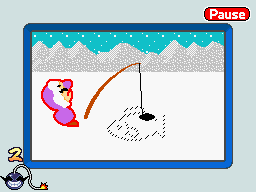 To win the game, the player has to have Wario catch the fish in the frozen water. To do so, they has to tap Wario when the fishing rod is moving. If done so, they win the game. However, if he misses the fish and the fishing rod is broken, they lose. "Ice fishing, baby! Tap me when the pole twitches to reel 'em in! I can't wait to see what kind of fish you'll have me catching!" This page was last edited on July 18, 2018, at 10:02.